Sri Lanka has dismissed calls for an independent inquiry into claims of human rights abuses by the military, saying its own courts will investigate. Foreign minister Rohita Bogollagama said the claims that heavy weaponry was used in civilian areas during the war with Tamil rebels were "fictional". He said the claims were being used to boost accusations of genocide against the country's Tamil minority. Aid agencies and the United Nations have called for an inquiry. The exact number of civilians killed in the final weeks of the long-running war has not been established, but one report put it as high as 20,000. An unverified and unofficial UN estimate said that more than 7,000 civilians were killed and another 13,000 injured in the conflict from January to April this year, according to the BBC's Anbarasan Ethirajan in Colombo. Mr Bogollagama said the allegations were intended to discredit the armed forces and embarrass the government of Sri Lanka. Government forces were ordered to stop using heavy weapons on 27 April. From that time onwards they were supposed to observe a no-fire zone where 100,000 Tamil men, women and children were sheltering. "Those transmitted, unsubstantiated allegations against the military claimed heavy weapons in civilian areas being used in order to buttress the propaganda of genocide against the Tamil people," Mr Bogollagama said. "This was both fictional and well-fabricated, with ulterior and sinister motives, in order to discredit the armed forces, as well as to embarrass the government of Sri Lanka." He said now that the war was over, the country would seek to rebuild. "Our people are weary of war, yet they are resilient and want to get on with their lives. "Therefore, the post-conflict period will focus on rehabilitation, resettlement, economic development and holding free and fair elections." The UN's senior humanitarian affairs co-ordinator, John Holmes, said that while the estimates had no "justification," the claims were serious and needed to be investigated. Human rights group Amnesty International also called on the UN to investigate. 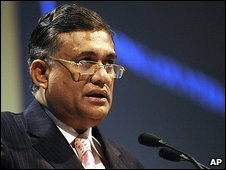 But Mr Bogollagama, speaking during a summit of Asian defence ministers in Singapore, told Reuters: "Sri Lanka is a sovereign country with its own legal framework. "We have a very strong separation of powers (and) the judiciary is independent." The foreign minister also appealed for international help in disabling, what he described, as the Tamil Tigers' powerful political lobbies outside Sri Lanka that were seeking to resurrect the movement. "It is important for the international community to take all measures to assist the government of Sri Lanka, to track down the global network of the LTTE (Tamil Tigers)," Mr Bogollagama said.